Fun In Hi Skule kept evolving and soon the school concert in the second act took the form of a reunion twenty years later, entitled Mr. Green's Reception. Initially the two acts played as a double bill but by September 1912, Mr. Green's Reception was performed on its own. Almost simultanously (the last appearance of Marx and Lee was on 9 August 1912), Chico finally joined his brothers together with his most recent partner George Lee. 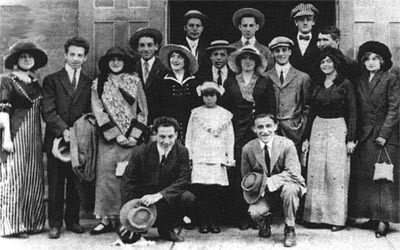 Harpo has described this reunion in his autobiography; "In the middle of my first bit in School Days, the business with the orange in my hat, I happened to look into the orchestra pit. I couldn't believe my eyes. Instead of giving the orange to Teacher, I let out a whoop, wound up like a baseball pitcher and heaved the orange at the piano player in the pit. The piano player caught it and threw it back. When Groucho and Gummo saw what was going on they started whooping too. We heaved everything we could get our hand on into the orchestra pit - hats, books, chalk, erasers, stilettos. The piano player surrendered. He climbed up onto the stage, sat at one of the school desks, and joined the act. It was Chico. I don't remember much about the rest of the performance that night, except that Chico ad libbed a hilarious part as an Italian boy..."
Mr. Green's Reception was a larger-scale, extravagant piece with an on-stage crew of twenty-one: four Marx Brothers, Paul Yale, George Lee and fifteen pretty girls ("with short skirts, yaller hair and pink stockings"), including Vera Bright, Dot Davidson and Saba Shephard, all in the troupe for several years. 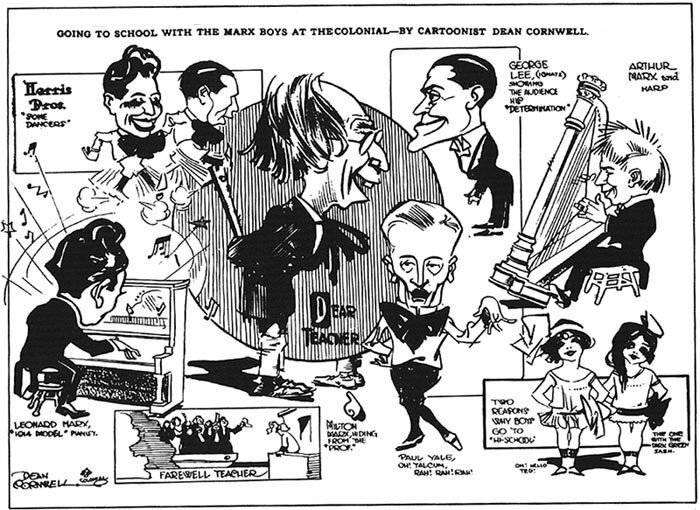 The show took place at a garden reception given by the old "Dear Teacher" (as he is named on Cornwall's cartoon seen above, a nice Anglo-German wordplay on "der Teacher"). "Mr. Green was the new name we gave to the Teacher", Harpo wrote. "On the anniversary of his retirement, he invites his old pupils to a reception at his vine-covered cottage in the country. Patsy, Giuseppe, Izzy and Mama's Boy are grown men now. They have become, it so happens, singers of songs, players of the piano, pluckers of the mandolin, and fun-loving comedians. They give their old teacher a gala entertainment." Groucho And who might you be, my good fellow? "Mr. Green's Reception is in three acts and is described as a 'modern mixture of mirth, melody and motion'. In it are an unusually large number of tuneful melodies, the principal ones of which are When I Met You Last Night, Circus Day, Roll Me Around Like a Hoop, My Dear, Yittsky College Boy, Days of Boys and Girls, Hello Mr Stein, Beautiful Nights, Beautiful Girls, Robert E. Lee and other tuneful triumphs. Among the special features that will be introduced are the lazy levee slide, the spectacular ship scene, the big cabaret entertainment and fun in a country school, each of which is said to be a winner as a pleasing musical comedy contribution." Kalamazoo Gazette also mentioned that the "comedy harp playing by Arthur Marx is a winning card. He is not only a really good performer on this instrument, but he can make it do some laughable stunts, too. It's worth hearing and seeing, especially the way he hypnotises the members of the company to do all sorts of freak movements to his accompaniment." On 13 November 1913, the Salt Lake Telegram noted the entire chorus of Mr. Green's Reception sang Apple Blossom Time in Normandy in the "beautiful garden scene". In his autobiography, Harpo describes how Groucho attempted to sing the original tenor's aria and how this developed into classic Marxism; "After about twelve measures, a hysterical, compulsive urge for horseplay crept over him (we all felt it coming on, what with Minnie gone) and he stopped singing. "I don't like your key, Giuseppe", he said to Chico. "How about this key, boss?" said Chico, transposing to C-minor. "Worse", said Groucho. I was standing in the wings. But not for long. This was too much fun to miss out on. I ran onstage and bumped Chico off the stool and began to play The Holy City, the quickstep-march variation. Groucho knocked me off. Chico knocked Groucho off. I knocked Chico off. Through the whole wacky round-robin the piano kept being played and Groucho kept singing La Donna E Mobile - in double-talk Italian. Well, it brought the house down. We kept on clowning all the way to the finish, when we played a six-hand, three-key version of Waltz me Around Again, Willie - Chico on the stool, me sitting on Chico's shoulders, and Groucho behind us, reaching his arms around Chico like tentacles, and all of us singing. We collapsed like a house of cards, jumped up, grabbed our mandolins, and sailed into Pease Weasie. We had never had such fun or such an ovation before. We took seven bows, and there was no need for anybody to sing Dixie." Much of what the Marx Brothers did afterward was influenced by Fun In Hi Skule/Mr Green's Reception. As the African explorer in Animal Crackers, the appointed leader in Duck Soup, the famous medical in A Day At The Races or even as the quizmaster in You Bet Your Life, Groucho was still playing Herr Teacher. Harpo donned his famous red wig and his beloved harp while Gummo played the juvenile straight man character ("purely because I was the tallest and the best looking", Gummo claims in The Marx Bros Scrapbook) which Zeppo later inherited. When Chico joined the act, he was already the confidently ignorant "Eye-talian". Routines like the piano-shifting bit described above by Harpo originated in this show (it was captured on film in The Big Store) and Chico's habit of playing the piano with an apple or an orange (revived in Go West) might as well have originated in these "slapstick-and-applesauce" days. Pease Weasie was the exclusive finale song of Fun In Hi Skule/ Mr Green's Reception. According to Groucho it was written by Charlie Van, half of the Charlie and Fannie Van vaudeville team. The Marxes bought it for $ 27 and it was sang at Marxian family gatherings well into the 1960s. Groucho revived the song for a 1959 TV appearance with Dinah Shore (also included in one of the TV documentaries). Another recording of Groucho performing a verse is also available in a TV documentary and two verses - whether they're accurate or not - are featured in Kyle Crichton's biography The Marx Brothers. Two more verses appear in Jo Adamson's book Groucho, Harpo, Chico and sometimes Zeppo and one of those is also in Simon Louvish' Monkey Business. The version above is pieced together from all these fragments. Verse 1 is from the solo Groucho recording, verse 2 is from both Shore and Adamson, verse 3 is from Adamson and Louvish, verse 4 is from Adamson, verses 5 & 6 are from Crichton. The refrain appears in all sources. Peasie Weasie, what's his name? Peasie Weasie, Peasie Weasie, what's his game? He will catch you if he can. Peasie Weasie, Peasie Weasie is a bold bad man. Put him in the fire/pan and the fire he felt. I never smelt a smelt like that smelt smelt. "Well, slip on something quick, here comes Mr. Brown"